A customer drew the proprietor's attention to the spelling. 'Hasn't anyone told you of it before?' asked the patron. How can you be creative enough to get noticed by your prospective customers? Traditional marketing approaches often don't work, especially when new market niches are created. By demanding and encouraging creativity and outside-the-box thinking with no holds barred, business leaders and innovative marketers can achieve explosive growth. The effort involved can be remarkable, but so can be the rewards for your business. How are you going to stand out from competitors? Apart from cutting edge products you need design and implement cutting edge marketing strategies. Yes, traditional marketing techniques can deliver average results, but "out of the box" solutions can make wonders. 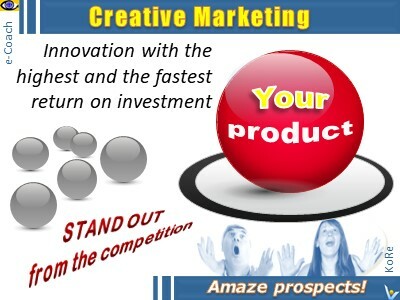 Creative marketing will help you generate the results you’ve been looking for. Unique original low-cost marketing ideas can help you grow your business tremendously. Innovative marketing strategies can move your brand quickly from an intriguing concept to a household name. In selling, you must also be creative to make an impression on your prospects if you wish to get the business. Estee Lauder simply refused to give up. When she wanted something, she used highly creative tactics to get it. She resorted to one such tactic to break the prestigious Galleries Lafayette account in Paris. When the manager refused to stock her products, Lauder “accidentally” spilled her first women's fragrance Youth Dew on the floor during a demonstration in the middle of a crowd. Before spending a single dime in traditional marketing, Half. com captured the attention of the media, and the Internet community. Time magazine called it "one of the greatest publicity coups" in history. Design a synergistic marketing strategy to become remarkable and make prospects fall in love with your firm. Five Ways to Win Over Customers, Carmine Gallo, author of Fire Them Up!